The US veterans visit an Explosive Ordnance Disposal site of RENEW-NPA team in Ai Tu Village of Trieu Ai Commune. 8 March 2018. Photo: Rim Benazzouz, Canadian intern at Project RENEW. 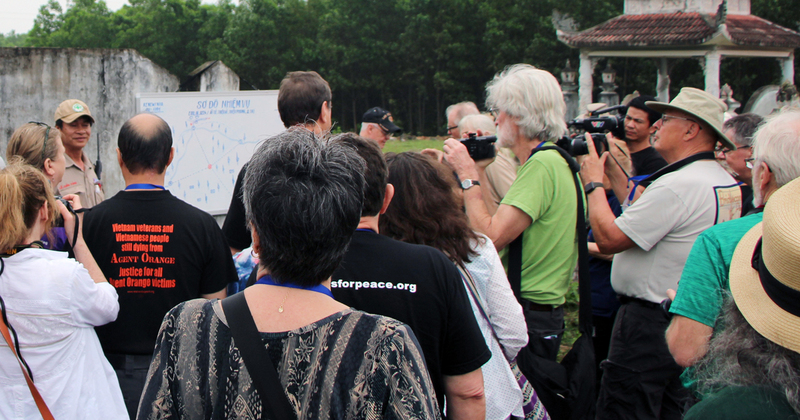 Part of their visit to Vietnam from 4 to 21 March 2018, a group of 38 Americans, mainly veterans and anti-war activists, member of the Veterans For Peace Chapter 160 (VFP) traveled to Quang Tri on 8 and 9 March to learn about Project RENEW’s ongoing response to address the war consequences in cooperation with foreign non-governmental organizations. VFP Chapter 160 is the only American veterans organization with members living and working in Viet Nam, and vets and associate members in the U.S. Its mission is to address the legacies of America’s war through contributions to the recovery still underway from Unexploded Ordnance (UXO) and Agent Orange/dioxin. 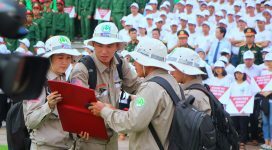 On Thursday, the VFP group toured the Mine Action Visitor Center in Dong Ha where they were briefed about the lingering impact of the war consequences upon the land and people of Quang Tri and explained of current efforts to survey and clear UXO, assist victim families and educate children and adults of UXO risks of the past twenty years. While touring the Visitor Center, the group met with ethnic minority schoolchildren from Vinh Linh who were attending a UXO safety session, one of the key activities of Project RENEW’s Mine Risk Education funded by Irish Aid. The group later visited the Trieu Phong District Blind Association’s new workshop built under donations from RENEW’s international partners like John Younger Trust, Unlimited Possibilities and VFP. This support has enabled 30 members of the Blind Association to make brooms, toothpicks and incense for sale to earn income. 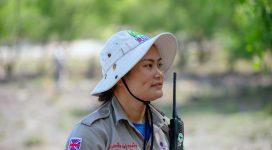 In the village of Ai Tu, Trieu Ai Commune, the Americans observed an Explosive Ordnance Disposal (EOD) team of RENEW-NPA safely destroy in place six items of unexploded ordnance in Ai Tu Village of Trieu Ai Commune. The EOD spot task was conducted after local people reported they found wartime ordnance while building community football field. In addition to technical survey operations to map out contaminated areas for full clearance, RENEW-NPA maintain EOD teams to provide quick response to UXO callouts from the local people, ensuring safety for their daily activities. The survey and clearance effort is being funded by the U.S. Department of State. 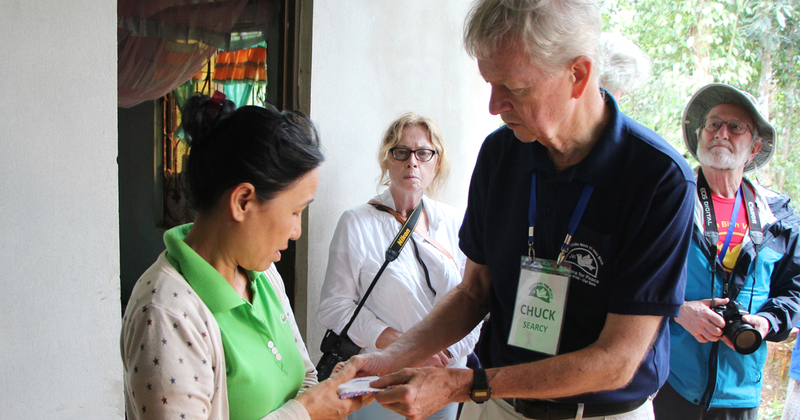 Chuck Searcy, President of VFP Chapter 160, International Advisor of RENEW, gives a gift to a single mom of a disabled daughter in Nghia Phong Village of Cam Nghia. 8 March 2018. Photo: Rim Benazzouz, Canadian intern at RENEW. 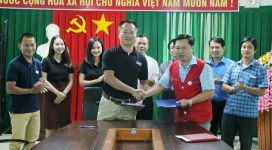 In the afternoon, the Americans arrived in Cam Nghia Commune, Cam Lo District to visit two families of children with severe disabilities assumed to be caused by Agent Orange/dioxin. With funding provided by VFP, RENEW worked with Cam Lo Association of Agent Orange Victims to provide these families with breeding cows, home renovation and hygiene improvements.